The following article was written by Ruth Cole Burcaw as a response for the most recent edition of The Hinge, a forum for theological discussion in the Moravian Church, which featured the 2012 Moses Lectures, “How Moravian Are the Moravians? The Paradox of Moravian Identity” by Peter Vogt. Published by the Center for Moravian Studies, this article is reprinted with permission from the Winter 2013-14 issue. Visit the Center’s website to read the full transcript of the lecture and other responses. Peter Vogt’s thorough examination of the “Moravian-ness” of Moravians was enlightening and thought-provoking. His conclusion that “our concern about the identity of what it means to be Moravian should not be guided by the fear of loss…or by the focus on preserving our historical heritage, but rather by the desire to become what God is calling us to be” is a spot-on prescription for being the church in the midst of today’s uncertainty and rapid change. The future of religion in America seems dire. A survey by the Pew Forum on Religion & Public Life details statistics and explores the shifts taking place in the U.S. religious landscape. 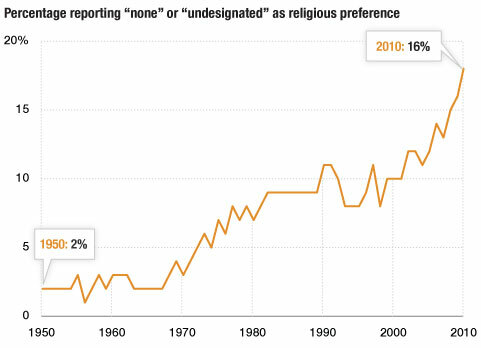 Over 16% of Americans now claim no religious affiliation. Among Americans ages 18-29, one in four say they are not currently affiliated with any particular religion. More than six in ten Americans age 70 and older (62%) are Protestant. 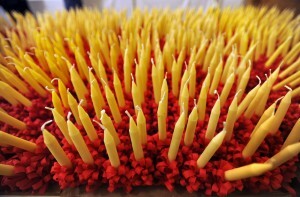 In fact, roughly half of members of mainline Protestant churches are age 50 and older. News like this tempts us to close our eyes and hang on even more tightly to our “Moravian-ness,” but it may in fact be time to zoom out and view the situation through a wide-angle lens. Such a view might help us to see what opportunities we might be missing and respond with intention and focus to the future as it unfolds. In her latest book, Christianity After Religion, Diana Butler Bass reminds us that what we perceive as a decline in traditional religion is part of something much larger—a great awakening—and a beginning rather than an ending. While church as we now experience it may change, this new spiritual awakening can bring us together in a fresh, vital way of faith still true to the message of Jesus. In her “zooming out,” Bass finds hope for the future of faith. After we examine the big picture, it’s time to focus on our own reality. We’ve all been asked the question, “What one thing would you take with you if your house caught on fire?” Most go straight to living treasures—spouses, children, and family pets. Others describe priceless heirlooms such as the family Bible, old photographs, or Grandpa’s banjo. Either way, the answer is easy. When confronted with overwhelming loss or change, we know exactly what it is that matters most to us. Now, imagine for a moment a future where. . .
the rapid increase in gluten allergies means no more lovefeast buns or sugarcake. Fan yourself, then breathe deeply and think, with the church “on fire” much like our hypothetical house fire, what do we take with us? The answer is easy. When confronted with overwhelming loss or change, we know exactly what it is that matters most to us. Christ and Him crucified remain our confession of faith. We respond to this gift of grace with our faith in God, our love for God and our neighbor, and our hope in this life and the next. The good news is we don’t have to leave all of our beloved traditions behind. Some remind us of our deep connection to one another and to our God. Others sustain us as we pray for the courage and persistence to zoom out, to ponder the big picture and the challenges that the future will continue to bring. We then are able to zoom in on the essentials as we find new ways to do and be church in a changing world. The great ideas from our ancestors still call us. And out of the best that is our past comes great possibility for a future built on faith, love, and hope. 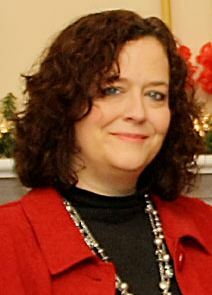 -Ruth Cole Burcaw is a member of Unity Moravian Church in Lewisville, NC. She is also the Executive Director of the Board of Cooperative Ministries for the Moravian Church, Southern Province. 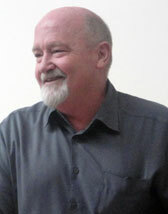 Bass, Diana Butler. Christianity After Religion: The End of Church and the Birth of a New Spiritual Awakening. New York: HarperCollins, 2012. Collins, Jim, and Hansen, Morten. Great by Choice: Uncertainty, Chaos, and Luck—Why Some Thrive Despite Them All. New York: HarperCollins, 2011. U.S. Religious Landscape Survey. Rep. Pew Forum on Religion and Public Life, 2007. Web. I found my father’s remarks from when he received the Hus Award in 1987, type-written. He acknowledges that his work of translating the Hebrew Scriptures into Miskitu “follows closely in the tradition of Jan Hus.” He goes on to say that it was “extremely important for Hus that people hear God’s Word in their own language and understand its true meaning for their lives.” I would add: important for Hus, and important…for us. Maybe his observation was less obvious than we might like to think. And maybe learning those different words is part of the ongoing challenge of Hus’s legacy. Because, you see, words and their meanings can change not only from place to place, but also from time to time. So, for example, in English, in our time, when the church says to the world, “All are welcome,” the world can mistakenly understand us to mean that… “all are welcome.” Now, of course, we all have our ideas concerning the ones who should (and should not) be part of that “all.” In the Moravian Church, with our rich mission heritage, we have been pretty good, I believe, at going into all the world and learning to speak the different languages of many people. But I believe that the church must communicate in the language of the people not just in South Africa and South America and South Asia, but also South Bethlehem. Not just in Eastern Tanzania or Eastern Nicaragua or the Eastern West Indies, but also East Winston, where we sometimes seem to be more hesitant to go. Are we still communicating in the language of the people? Or are there obstacles to that effective communication? I came to Moravian Seminary after serving for about 15 years in what might be called (by people who like categories) a more “conservative” part of the Moravian world. (For example, my Bible only had on Isaiah.) Now, did I agree with everything that I was taught or exposed to in Seminary? Of course not. But I learned something extremely important. That is, if we’re going to disagree with someone, let’s make sure that we are disagreeing with what they are actually saying and not with what we think they are saying and not with what we think they are saying or what we assume they will say. Let’s listen and learn their language. Let’s use the tools of Biblical Studies and Pastoral Care and Church History and Leadership and Christian Education and engaging worship to dig deeper into the world and -yes, the world, all around us- exegete the culture in which God has granted us to live and recognize that God might even speak a word for us…through them (whoever they might be). Listening, learning and communicating the good news in the language of the people of our time and place. It’s not just getting rid of the “thee’s” and “thou’s” or the “he’s” and “him’s” (that’s h-i-m) or, for that matter, replacing the other kind of hymns with more contemporary songs. I’m not talking about watering down the message or selling out to the culture to make it more relevant. I’m talking about communicating the faith, love and hope of our Creator, Redeemer and Sanctifier in a way that can be heard and owned by people today, and so recognizing that these things are not just for us, but for all the world. 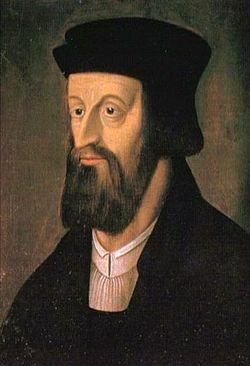 Jan Hus was willing to die for his convictions. I guess the question for us is: Are we willing to live for ours? I close with my dad’s closing words when he received this award 27 years ago: “Thank you for this award. May God bless all of us who go out from this seminary that in all our varied areas of ministry we may be bound together by one major goal: the proclamation and the spread of the truth of the word of God.” Thank you. The Board of Cooperative Ministries looks forward to celebrating the life of John Hus by recognizing the 600th anniversary of his martyrdom through the Comenius Learning Series events beginning this fall through 2015.